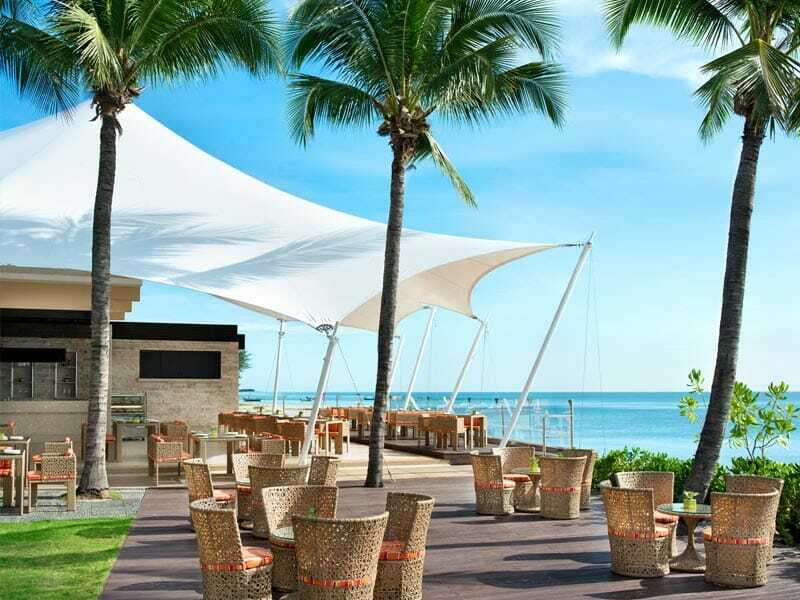 Nestled against a picturesque sandy beach just 10-minutes from the major centre of Hua Hin you’ll find the Sheraton Hua Hin Resort and Spa. This modern resort feels secluded and relaxed and is a perfect spot to unwind and let your worries disappear. The huge, sparkling blue lagoon-style pool winds around the resort and is surrounded by manicured tropical gardens and shady palm trees. There is an impressive list of amenities to be found on-site here including restaurants and bars, a fabulous day spa and a fitness centre. With wonderful accommodation options, 5-star service from the friendly team and lots to see and do, this is an ideal place for your next dream holiday to Thailand. 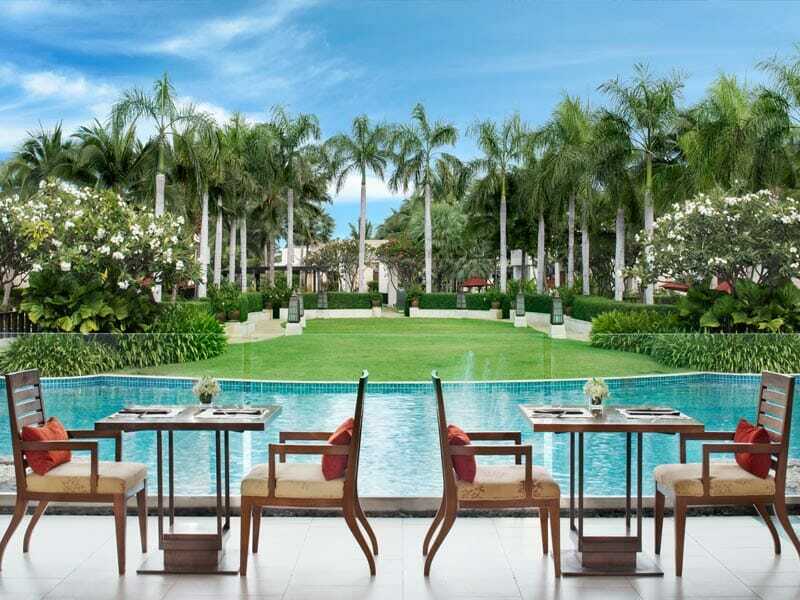 The resort is visually stunning, with the accommodation buildings placed around the meandering lagoon pool and amongst the towering palms trees and gardens. 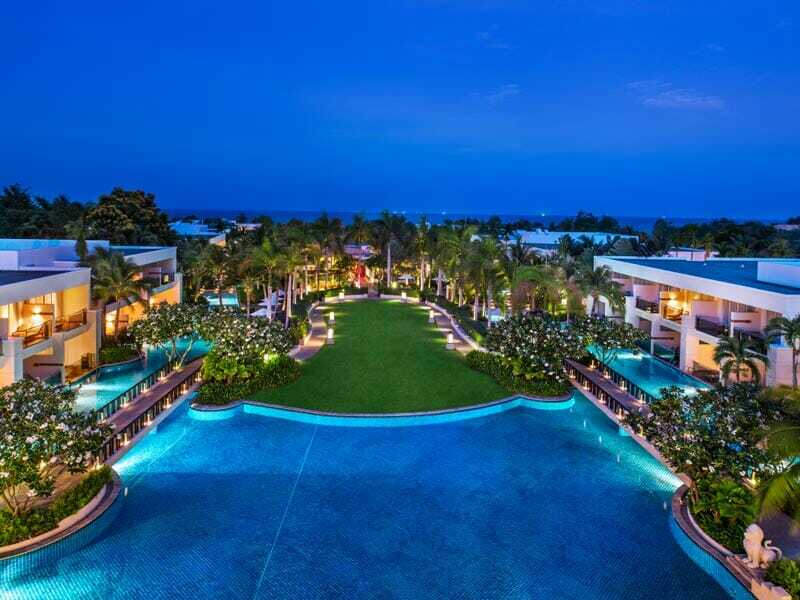 The contrast between the brilliant greens of the gardens and lawns and vivid blues of the pool is striking and the resort is set against the wide panorama of the ocean just metres away. With 228 rooms and 12 suites available in a variety of sizes and sleeping configurations, the resort is big enough to provide you with plenty of accommodation choices but has been designed so that you don’t have to deal with crowds of people in this laid-back environment. The resort has a family focus and you’ll find a wonderful Kids’ Club that provides a safe and exciting environment for the little ones to enjoy and there is a dedicated children’s pool that has lots of spots for the parents to relax nearby and still keep an eye on the kids. The 5 different restaurants and bars at the hotel give you some fantastic dining options and showcase some exceptional local dishes as well as a wide range of international cuisines to try. With dining areas overlooking the lagoon pool and also right on the beach, you can dine with a stunning view of your choice. If you’re feeling stressed and run-down, it could be time to head to the Shine Spa, a tranquil day spa where you can choose from a menu of relaxing massages and blissful health and beauty treatments, all performed by expert therapists in a serene environment. When you need something more physical, the fully functional fitness centre has a great range of cardio machines and free weights for you to use. You will also find multiple walking paths surrounding the resort. 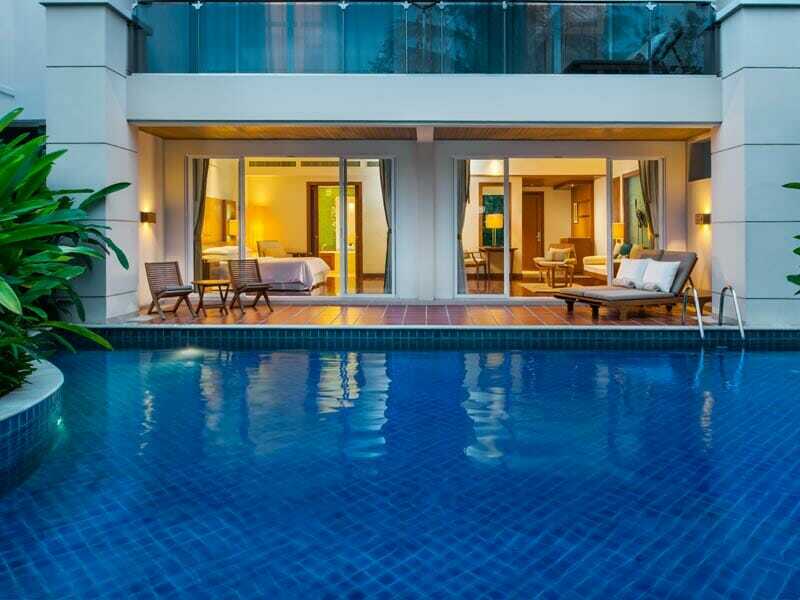 Why Go to Sheraton Hua Hin Resort & Spa? This is the perfect destination when you are looking for a relaxing time in a modern and beautiful resort that can provide you with every amenity you could want. 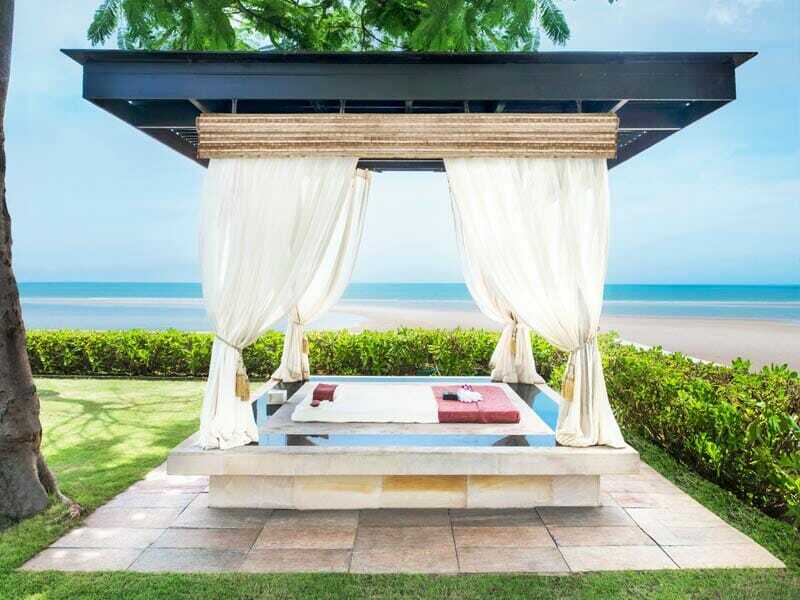 Whether you want to spend your days relaxing by the pool or soaking up some warm Thai sunshine on the beach, you’ll find plenty of secluded spots that you can enjoy all by yourself. 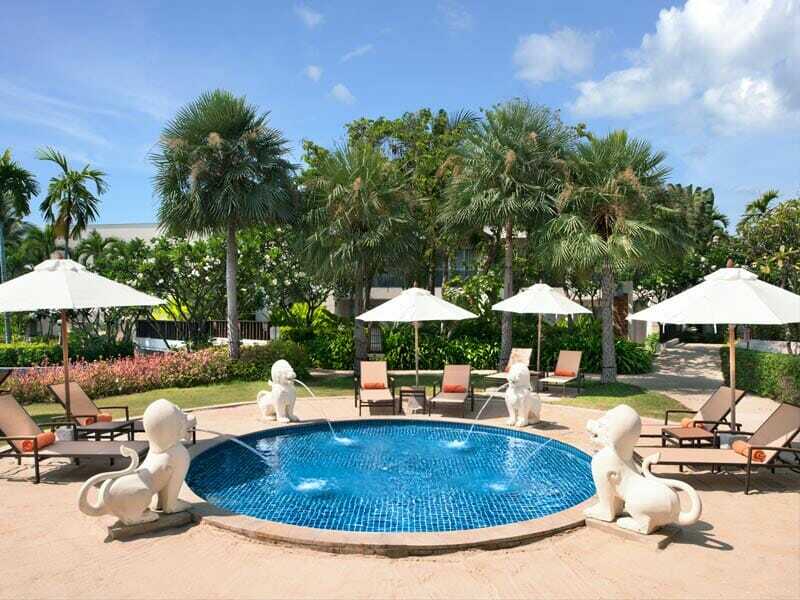 With a fantastic range of dining options, high quality accommodation and a great range of activities just for kids, the Sheraton Hua Hin Resort & Spa is an ideal spot for couples, families and groups. This room has a modern and open design, with plenty of natural light, timber finishes and lively splashes of colour. The room is a generous 49sq. metres in size, which gives you lots of space to spread out and enjoy yourself in comfort. You have a choice between a King-size bed or 2 Twin beds, so the room will easily sleep 2 to 4 guests. 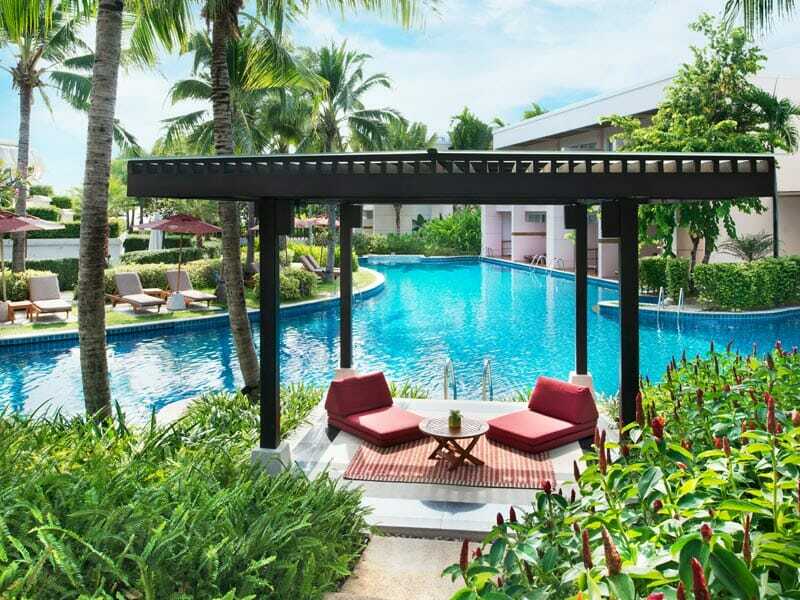 Kick back on a sun lounge on your private balcony and enjoy views over the lagoon pool area while you soak up the glorious Thai weather. If you feel a little warm, then head inside to your air-conditioned oasis, a perfect spot to relax and enjoy premium movie channels and a huge range of satellite channels available on the 40-inch TV. The deluxe bathroom has a deep soaking bathtub, which is a wonderful way to wind-down at the end of the day. The room also comes with a minibar, complimentary bottled water, tea and coffee facilities and an in-room safe for valuables. The resort is situated right on a long sandy beach, just 10-minutes from the centre of Hin Hua, which is a major regional centre 200-kilometres south of Bangkok. Although you will find every amenity you will need at the resort, it’s a simple shuttle ride into Hua Hin if you feel like shopping or exploring. If you arrive in Thailand via Bangkok then you have several choices to get to Hua Hin, including hire car, taxi, bus and train. 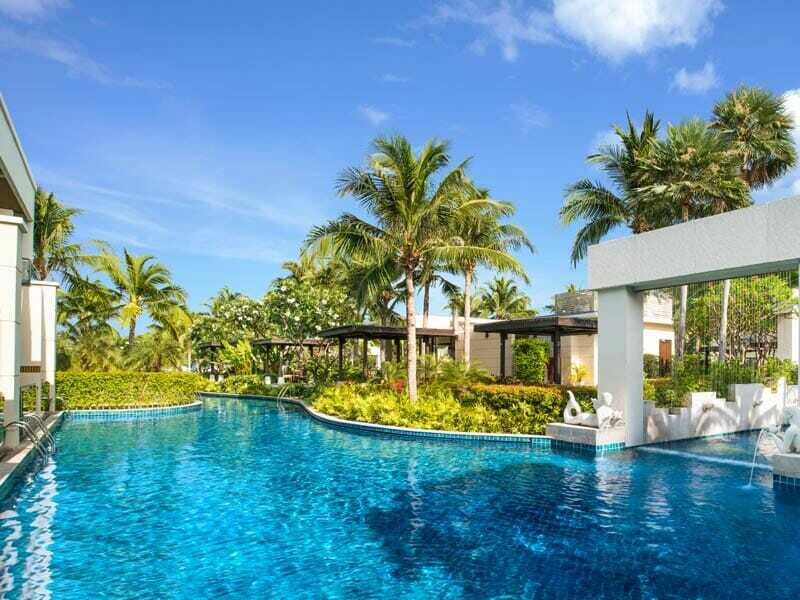 The pool area is huge and gives you lots of places to cool down in the water or relax in a sun lounge under the shade of a palm tree or umbrella. The beach is just metres away and you can enjoy some time sunbaking on the sand or trying some of the water sports that are offered such as kayaking, paddle boarding and snorkeling. It’s also a lovely beach for a morning walk along the sand. The resort has a tennis court you can use and a fully-equipped gym if you’re in the mood for a workout. You’ll also find plenty of places in and around the resort to take a walk or jog. For a rejuvenating experience, head to the Shine Spa where you can choose one the many day spa treatments on offer. Catch the shuttle bus into Hua Hin and you’ll find lots of activities on offer. There are half-day tours to explore the local area, several food and craft markets to visit, art galleries that showcase talented local artists as well as plenty of cafés, restaurants and bars to try. This property far exceeded my expectations. My fiancé and I stayed the weekend at the Sheraton and had an amazing time. The room was large and had everything we needed. The pool was amazing, the food wonderful and the service was on point. We would highly recommend staying at this resort and plan on staying there again someday.